Pit viper This post may contain affiliate links. If you make a purchase, My Modern Met may earn an affiliate commission. Please read our disclosure for more info. Photographer Mark Laita has a career that spans over 20 years, with his clean, graphic imagery used by clients such as Apple and BMW. Bringing these sensibilities to a different arena, his project Serpentine saw him photographing a wide variety of colorful snakes. Intrigued by their contorting bodies and colorful skins, the series is a natural evolution of his work, which has also seen him capture vibrant sea creatures. For Serpentine, which is also a stunning photography book, Laita visited zoos, breeders, and private collectors across the United States and Central America. He selected his subjects based on the most compelling species, often trying to photograph the serpents just after they’d shed their skin and the colors were most vibrant. Of course, the project was not without great risk—many species captured are highly venomous. And though Laita didn’t start the project with a fear of snakes, he used to catch them as a kid growing up in the Midwest, one event surely made an impression on the photographer. Black mamba biting the photographer. While photographing a black mamba at a facility in Central America, the deadly snake struck. “It was a very docile snake,” he recalls. “It just happened to move close to my feet at some point. The handler brought his hook in to move the snake, and he inadvertently snagged the cord from my camera. That scared the snake, and then it struck where it was warm. That happened to be the artery in my calf.” Miraculously, though the blood soaked through his socks and shoes, he survived the bite. Considering the black mamba’s venom is deadly and can potentially make a person collapse within 45 minutes, Laita is extremely lucky. In fact, he was so preoccupied with the shoot, he didn’t realize he’d been bitten until the handler told him. After 20 minutes of feeling ok, he decided not to seek medical attention—something herpetologists later told him was a big mistake because something could have happened even hours later. It was only the next day he realized he’d actually snapped a photograph of the bite as it occurred. 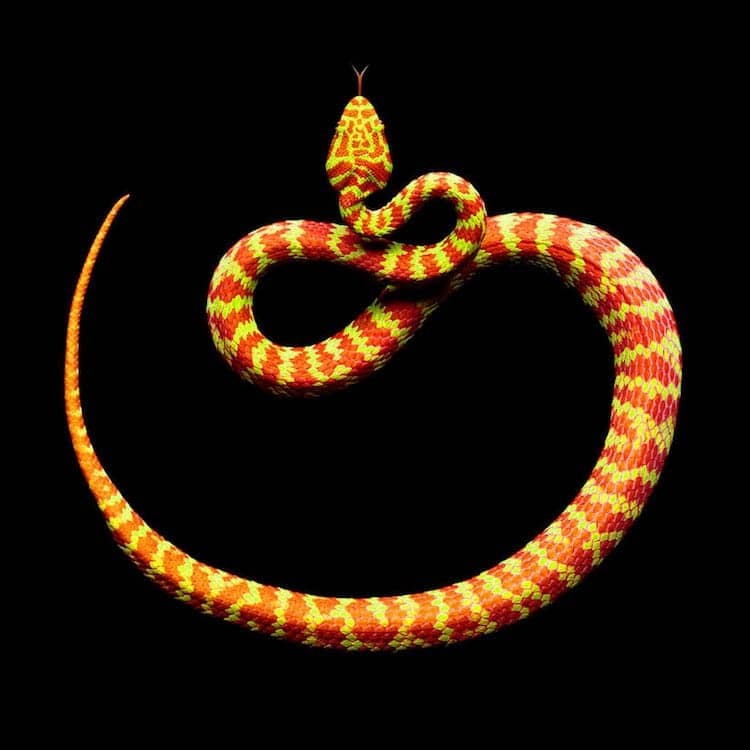 Mark Laita captures the vibrant beauty of snakes in his photography book Serpentine. My Modern Met granted permission to use photos by Mark Laita. The post Photographer Survives Deadly Snake Bite While Taking Colorful Serpent Portraits appeared first on My Modern Met.